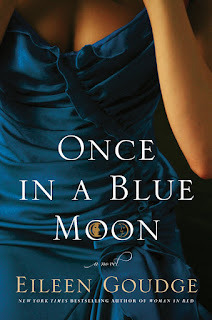 THe One2One Network recently sent me a copy of Eileen Goudge's new book, Once In A Blue Moon, to review. I was very excited, as I've read several of Eileen Goudge's previous novels. I eagerly anticipated diving head first into this book and losing myself for a few days. Unfortunately, that is not what happened. This book was just not my type of novel. I found it quite sad and depressing. The subject matter is quite heavy, covering everything from drug use to child neglect. There are up points, like a dash or two of romance, and some heartfelt family moments, but to me it just wasn't enough. I found myself not liking characters that I am pretty sure I was supposed to like. I guess it was just a lot more serious than I'd imagined. The verdict? It is not a terrible book, the plot is interesting enough to hold the readers attention. I just personally did not like it. Everyone's tastes in novels varies, this one was just not up my alley. I am still an Eileen Goudge fan and look forward to reading more from her.